Salvaging Undercooked Peanut Brittle | Tiffany Loves Cake! Anything in life worth making, is worth making sweet! I don’t always bake. I am a true lover of sweets though and this time of year, there’s just so many other good things to be made. 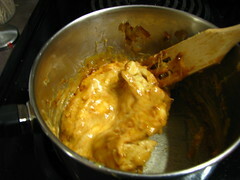 I have never made peanut brittle before, but I decided to give it a try. It’s delightfully crunchy, sweet, salty and sticky. It’s basically the perfect holiday treat! Bring corn syrup, sugar, salt, water and peanuts to a boil with a candy thermometer, stir occasionally with a wooden spoon. 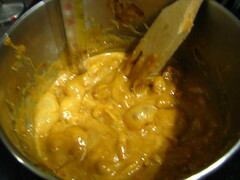 Bring the mixture up to hard crack (290-300), stirring more at the end, you don’t want the peanuts to burn. It should be turning a golden color. Remove from heat. Add vanilla, butter and baking soda. Stir it up until mixed. It should double in size. Pour onto two greased baking pans. However, twice now I’ve made a batch and had it come out… well… a gross yellow color. And it doesn’t even taste good. It’s too tacky in your teeth. Evidently, I didn’t cook it long enough, even though the thermometer read 300! So what could I do? The first time I tossed the offending batch. Heartbreaking, I know. This time I was determined to fix this some how. I googed how to fix it. I literally found ONE site where someone had microwaved it and then reheated it on the stove. They still weren’t totally successful though because they burnt the peanuts. Well, hell… I can do this I decided. I will make it happen. I considered my options and decided to just smash it and put it back in the pot. I split it into two batches so I could have more room to sir in the pot. I thought of adding more liquid, but decided not to. I started on medium heat, but turned it down to a bit below medium. KEEP STIRRING. While it’s still semi solid you MUST keep stirring or it WILL burn. I thought it was never going to turn into a liquid, but of course it did. I gradually turned it up as it melted more. But kept stirring occasionally to keep the peanuts from burning on the bottom. You haaave to let it come back up to hardcrack stage. If you don’t it’s not going to set right. I wanted to just stop and pour like 400 times because it looked and smelled ready, but I knew I just couldn’t. I stirred like crazy to keep it moving and not let it burn. As soon as it reached 300, I poured it. I pulled it out once it was cool enough and broke it up. Guess what? It was excellent! As if I’d never messed it up to begin with! I was so happy I wasn’t going to waste another 2lbs of brittle! It’s the perfect handmade gift! You could make and bag enough for probably 10 people for under $10 and it’s such a thoughtful gift. I hope this helps anyone who was as lost as I was! Happy Holidays and happy treat making! Most of all have fun and be careful! I have sustained a few burns from my brittle making adventures this year! Mostly from hot sugar bubbling and spitting out of the pan! I’m starting to think candy makers probably wear long sleeves. Ouch. I have burn blisters on two of my favorite tattoos right now and that’s a bummer! Anyhow, I cannot waaait for Christmas! 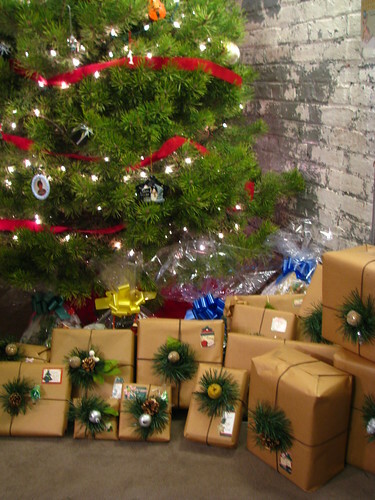 I have everything all wrapped up and ready to go! So come on and get here already! I’m super pumped to make peppermint cupcakes… and that means a lot coming from me! Everyone knows I am not a huge fan of making cupcakes! Previous Wisconsin Cake… surprisingly not made of cheese… Next Happy New Year! haha Good to see you over here. And yeah, I mean… someone had to do it!!! 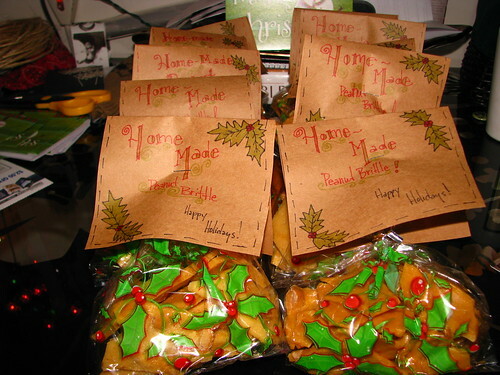 i experimented with bourbon brittle and pecan brittle this year. the bourbon brittle was good by me but judging from reactions you must have a taste for it. the pecan brittle however was amazing. if the nuts weren’t so much more expensive than peanuts i would never go back! 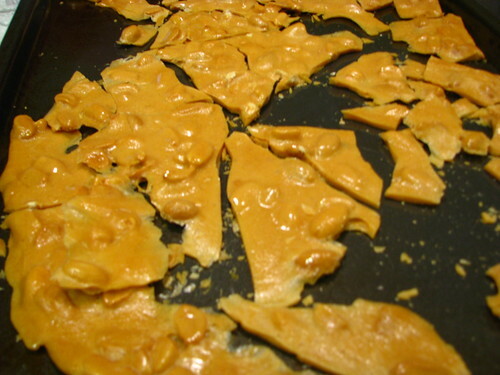 Excellent tutorial on salvaging peanut brittle and giving it a second chance. I made note of it, in case I run into this problem. 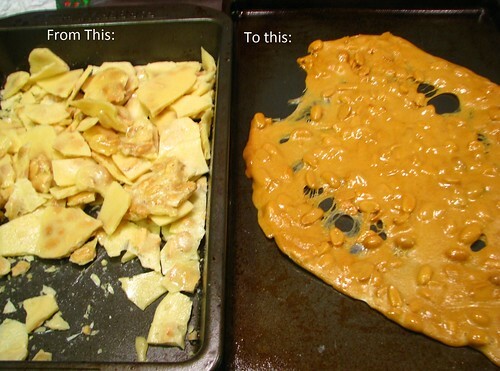 Thank you so much for posting this – we were about to toss 4 pounds of peanut brittle away. It worked great!! I just undercooked a batch of brittle because I wasn’t using a thermometer & I was afraid of burning it. Thanks to you I was confident I could save it so I broke it up and put it back in the microwave & cooked till golden brown stopping to stir. It turned out great. A million thanks to you for posting this. Next time I’ll use a thermometer. So glad it was helpful! I was so frustrated when I couldn’t find an answer when I was looking. So it’s nice to know I’ve helped a few people! I put the sheet pan into the oven on 400 degrees until it bubbled and turned golden brown. Thanks. I did add about 2 Tbs water and the process went fairly quickly. If the old thermometer failed you, like it did me, get a new one or go past 300 degrees. I made mixed nut and seed brittle-dried edamame, pumpkin seeds, pecan, peanut, sunflower I added a little soy, brown sugar and red pepper= did not use a thermometer and it turned to syrupy goo… it tasted really awesome so I had to save it! Found your site- THANKS for the help!!!! Sorry for the typos in the previous post. I just looked at the mess again. 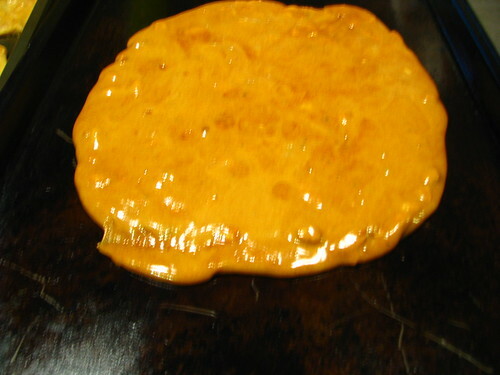 It sort of looks like a big cookie sheet of peanuts and caramel (and don’t forget the chocolate) … maybe I could make some kind of batter and throw it on top and try to bake it? :( :( :( I am so bummed …. what waste. Thank you for the fix! It worked wonders and I saved a couple batches. My first time making peanut brittle, followed the recipe to a T but it did not say to bring the candy to 300 so I stopped too soon. Thanks again. i was able to fix my peanut brittle thanks to you. I did however add an extra cup of sugar and corn syrup which help melt the soft brittle faster. I may have a situation where I need to recook my brittle…thanks for this post! You have save me SO MUCH MONEY and time! I made about 50 pounds of almond brittle last night, to realize this morning it did not set. After crying for a few minutes, I decided to turn to Googke, and I found your post. I hope I have as much success as you did! Thanks! Thanks! You saved my b…rittle! thanks tiffany! was winging it w/o a thermometer and paid the price. rescued! Receiving somebody to begin a bpog is simple. Individuals who want to blog can get stazrted one in seconds. particular machine within your shower, and then you enter inside as white-colored and omit as bronze. Hi. My peanut brittle just became gooey. I am going to put it back and follow your instructions. I just don’t have a candy thermometer, so should I just let it bubble and get dark? I had bad luck with microwave peanut brittle. It definitly was undercooked! I evidently left one of the steps out. When I poured it in the pan it was real light color….that should have been my first clue. It run all over the pan. I left it until it cooled and it was real runny. I would have thrown it out but I red your experience and thought what do I have to lose. I put it in the microwave pan and cooked it again, soda and all, the same times, stopping to stir as the recipe says. It turned a carmal color and I thought it wouldn’t taste good. Put it in the pan and spread it out. When it cooled it broke easily in pieces. It is dark carmel color but taste just fine (I thought it would taste burnt….not) So experiment with it before you toss it….what have you got to lose!!!! Hello- I made brittle last night and it never got hard so I searched for reasons why that might’ve happened and found your page here. I tried and and it worked. I am so happy I was able to save it. I am taking it to a party today. Thanks! Thank you so much for your post. Here it is 2015 and you still are the only one with advice for this problem. Made some brittle today for the farmers markets and it would not set up. Same recipe I use all the time. Too much humidity in the air, but thanks for saving the day. It worked like a charm!! I just tried this (or a similar approach) with undercooked caramel corn, and it worked! After boiling the caramel and the initial baking, the corn just never got crunchy – it was still too gooey and stuck in your teeth! The next day, I re-baked it. It was initially baked at 200F for 60 min, stirring after each 20 min, but this time I tried 350F, stirring after just five minutes (and you need it – it’s a noticeable difference in just five minutes, so don’t leave it too long!). 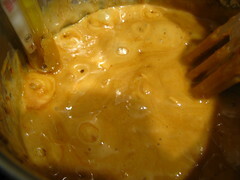 I just pushed it five more minutes, and five more minutes, until I thought the caramel might be darkening a bit too much – I ended up doing 15 minutes in total. It worked perfectly – I didn’t think re-baking the next day would have the desired effect, but I thought, based on this post, if I could get the temperature of the sugar high enough, it should work, and it did! Thanks!! Tonight… This saved me. And it worked like a charm. I made bacon brittle and under cooked it. I did exactly what you Said and now it is fabulous! Best tip ever. Thank tou so much. Thanksgiving Eve, 2015: today I made the brittle I have made many, many times before AND have boasted to my new hubby how great it is, and whaddya know…it came out gooey. Using an unfamiliar microwave (1350 watts), I was afraid I’d over cook it. Not paying attention to my intuition, I under cooked it instead. Just before tossing the mess, I decided to Google and prayed for a repair. YEAH!! This site is STILL the only place I could find a fix for Peanut “taffy”. THANK YOU THANK YOU THANK YOU! I tried this and must ‘ve gotten the heat too high because even though the peanuts didn’t burn, the candy part did. Next time I will do the oven trick suggested by one of your readers. I too had a booch of brittle, used your method and wooolay, it turned out fantastic. 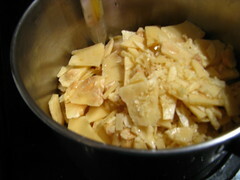 Then I used your simple recipe for the brittle and it was quick,easy and it tastes good. I also bought me another candy thermometer, that helped tremendously. SEPTA is promoting spectators a radically greater stage of support upon the ManayunkNorristown Line (Local Rail) in the course of the party. Prepare stations alongside the biking path contain East Falls, Wissahickon and Manayunk Station. For generate content material having general public transport, experience totally free in direction of get hold of SEPTA on the web and retain the services of the on-line style or speak function. Thank you, thank you for this information. With your advise I was able to salvage my chewy peanut brittle and it is now brittle like it should be. THANK YOU!!! I made p’nut brittle on a rainy day and it was sticky & chewy…not what I expected. I did as you suggested by putting it in an oven at 300 and waited for it to turn brown around the edges. YOU SAVED MY BRITTLE!!!! Thanks so much for this information! I broke my batch up into 3 different portions. I greased and microwavable 2 qt bowl and cooked each batch on 1 minute and then 30 second intervals. I have great peanut brittle now! 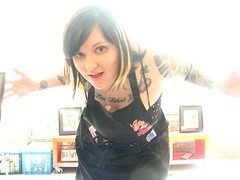 Liz Van Pay… my hetero life mate.